One of the byproducts of Sandy washing ashore was the pattern reset that took over the Mid Atlantic and Northeast for much of November. October 2012 was rather mild, especially in the week before Sandy trekked up the coast and hit us. The interaction between Sandy and a deepening trough in the Great Lakes resulted in that trough locking in place for a large portion of last November, bringing us a colder than average month and our coolest November since 1996. You might even remember the nor'easter that couldn't quite produce snow in the region but did in Central and North Jersey occurring not too far off of this date (it happened on November 7th). Yesterday's high of 48 in Philadelphia was our coolest since early April...and matched the high we reached a year ago in the wake of Sandy. The highs in Philly in November 2012 in the days that followed were 46, 45, and 42. With today's 50+ weather, such a streak can't be matched around here. Thanks additionally to the 70 degree weather we experienced late last week, temperatures this month are much closer to average than they were a year ago at this point. 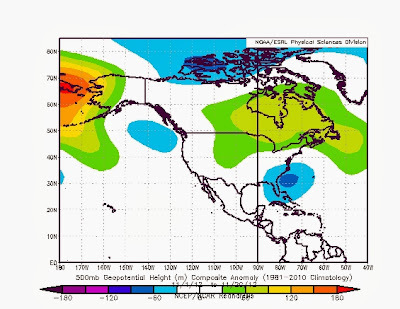 November's pattern last year featured a locked in trough over the Mid Atlantic and Southeastern US, a pattern that essentially allowed for cooler air to drain southeast from Canada and hold over the East Coast more or less through the month. The post-Sandy chilled shot produced a twelve day streak of below average temperatures in Philadelphia, one of the longer streaks we've seen in recent time until we had our fifteen day streak of below average "chill" in late July and early August this year. While we had a nice cool down in the wake of our warm up last week, the pattern isn't supporting any snow just quite yet, nor are we in a pattern that supports a locked in chill. We'll remain on a bit of a roller coaster at least into next week.